1. Bedtime – Start settling down with a quiet activity 30 minutes to an hour before bedtime arrives; perhaps save TV time until right before bed. Remind them that bedtime is coming up to slowly warm them up to the idea. Address any nighttime fears and acknowledge any nighttime rituals – night lights on, bedtime stories, favorite stuffed animals present. 2. Limiting Tech/screen time – Set a clear limit for screen time before engaging. Extend 10 and 5 min warnings when the time is almost up. Use exciting activities or snack/meal times to interrupt tech time with an equally or more appealing activity. 3. Separation anxiety – Consider arriving a little early to get acclimated to the child before the parents depart. Engage the child with a toy or activity before the parents say goodbye to ease the sting of seeming abandonment. Distract upset children with engaging activities. 4. Worried parents constantly checking in – Send parents updates easily through the ZipSit application by sharing pictures and text updates. Ensure parents of a successful session or ask questions should any concerns arise. 5. Feuding Siblings – Listen to each child’s feelings. Refrain from taking a side. Diffuse the situation with mutual apologies or refocus emotions into a new activity. Focus on cooperative activities rather than competitive games. Allow children to have alone-time here and there. Try to equally split your attention among each child. 6. Disciplining – Understand the house rules for disciplining style prior to sitting. Set clear expectations from the beginning and uphold expectations through to the end. 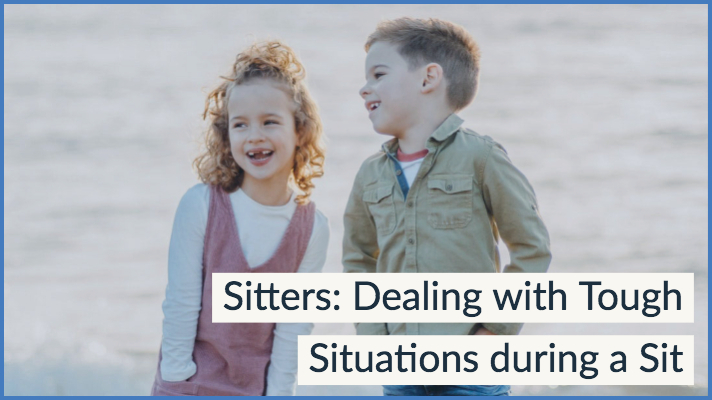 Be sure to ask any questions you may have about these tough situations and any others before the parent’s leave so you have a good understanding of the kid’s normal routine. If a question arises during the sit, don’t hesitate to reach out to the parents for further clarification.